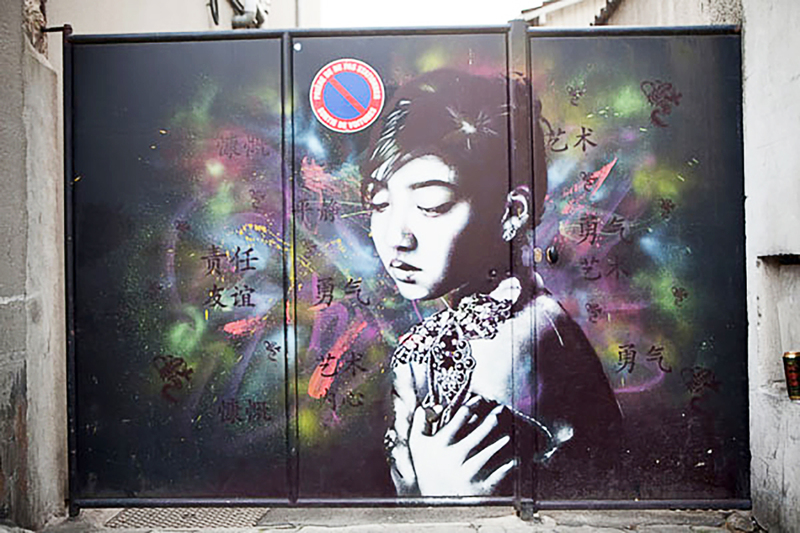 We first discovered the artwork of Fin DAC during a street art tour in Vitry. Then, we met Fin DAC during the launch of the book Vitry Vit le Street Art – (a must have if you don’t already) in Vitry. Artists who have participated in the book, were in Vitry for live painting and to dedicate the book. Fin DAC is from Cork in Republic of Ireland but he has lived in various parts of London most of his life. When he created his first street art piece, he was old enough to have known better. He is mostly working alone but he also paints with a few select artists. He has exhibited in galleries, mostly in London but a few scattered around the globe too. When is not painting, Fin DAC is a web developer/designer. To promote his artwork, Fin DAC uses all the social media tools… As he is heavily involved in the web as part of his day to day job, he uses that knowledge to ‘cross-pollinate’ from one format to another. Check out all his photos on his FlickR page here! His artwork size is varied, in fact he lets the location choose for him. Fin DAC always has ideas for next pieces, it’s important for him to keep that fire burning. Do your pieces work “alone” or “in a series”? His preferred street art style is stencils, but he thinks he does them in a unique way. And with the stencil technique, he loves doing portraits which he qualified as very ‘fine art’ but he thinks that resonates more with him and possibly more with people who view the work too. Fin DAC doesn’t have a favourite support. He allows his work “hopefully” to be defined by what he sees in front of him. To work, he only uses his stencils, Montana Gold and a few choice bits of cut card for detailed ‘spitting’ work. To paint, he always go with an open mind, a sense of humour and a steely determination to do the best he can for that day! His artistic references come from traditional artists like Dali, Francis Bacon and Aubrey Beardsley. And street artists like C215, Conor Harrington and B-Toy. In terms of music, he listens to about anything: from pop to hip-hop, acoustic to opera. And about movies, he can’t beat a good psychological horror. Without fail, he takes a photo in memory of all art pieces he creates! 3 things that Fin DAC loves in general: Popcorn, sneakers and his life. 3 things he hates: Haters, arrogance and ignorance! As we plan to go to London at the beginning of August, let’s catch up!